I will attend this event and will notify the Cadillac V-Club if my plans change and I am unable to attend. I understand that if I bring a guest, a guest fee payment of $25.00 is required at time of RSVP. I will attend this event and will notify the Cadillac V-Club if my plans change and I am unable to attend. I am not currently a member of the Cadillac V-Club but I own a Cadillac V-Series vehicle and would like to attend this event to meet the members and learn more about the V-Club before I join. Your meal is free and you may bring 1 guest for a $25.00 guest fee. 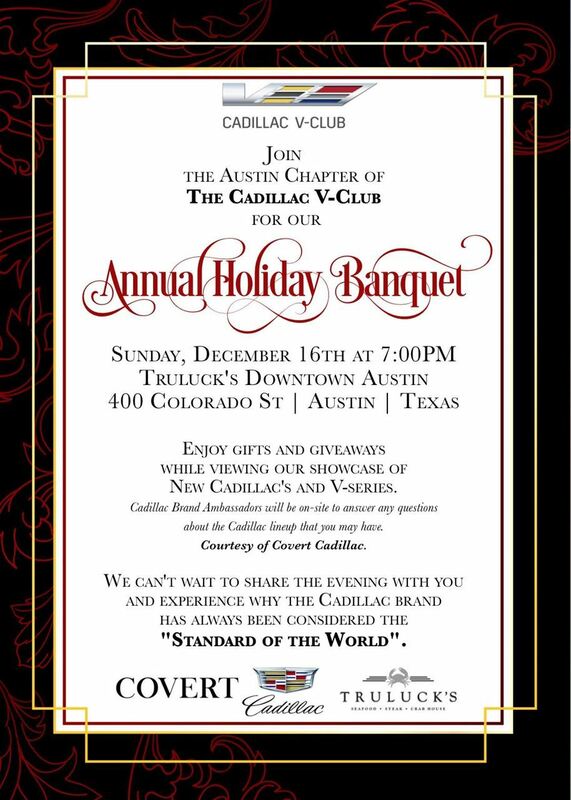 The annual holiday banquet for the Austin Chapter of the Cadillac V-Club will be held on Sunday December 16th @7:00pm. The event will take place at the #1 restaurant in Austin, Truluck's at their beautiful downtown location. The V-Club has a reserved private dining room and participants will be served a stunning 3 course dinner, followed by a one of a kind desert. Standard non alcoholic drinks will be included with your invitation, and a cash bar will be available as well. All V-Club members may bring immediate family members or "significant others" as guests however a guest fee will be charged at the time of your RSVP registration for members with a Single Membership who bring a guest. Members with a Family Membership or Sponsors of the V-Club will not be charged a guest fee for their immediate family members or employees. Due to space limitations of the private room, we are requesting that this event be limited to adults. Valet service will be complementary for all current V-Club members that display their Cadillac V-Club membership Id card upon arrival. To attend this event and also be eligible for a door prize, you must RSVP by registering via the CadillacVClub.com website. We have a private room reserved for this event and space is limited so please don't RSVP and be a "no show". If you RSVP and then your plans change, please be sure to cancel your registration so someone who is on the stand-by list can attend. Environmental stewardship and sustainability drive all aspects of Truluck’s operations. For this reason, they purchased their own crab fisheries to ensure that all crab is caught and prepared safely and humanely. They respect the seasonal cycles of marine life. They do not serve seafood out of season. This protects our aquaculture and ensures better-tasting, higher-quality food. Truluck’s serves 100% antibiotic- and hormone-free All Natural beef, pork and lamb. They only work with farmers that raise livestock traditionally and humanely, and feed all animals only the highest-quality 100% vegetarian feeds. All animals are raised exclusively on environmentally sustainable U.S. family-owned farms and ranches. At Truluck’s, they work hard to bring our customers the best-tasting, sustainable ingredients that make sense for the plate, the palate and the planet.